THE gentleman beside me is quite naked apart from a crown of vivid parrot feathers, ropes of shell jewellery crisscrossing his torso and two strips of tapa cloth slung from his waist to barely cover the naughty bits. We are strolling along a hibiscus-fringed path and chatting away as if this is the most natural circumstance in the world. 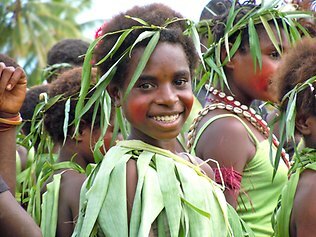 Which it is if you happen to be in constantly surprising Papua New Guinea.